The above picture pretty much says it all, doesn't it? It's so simple, so obvious, yet so brilliant. $19.95 per plate is a bit expensive if you deploy them all over your house, but I bet the average home could make make great use of a handful of these placed in smart areas for charging smartphones, tablets, MP3 players, etc. Each USB port kicks out a potent 2100 mAH, which should be plenty to charge any device that can accept USB power. I think I might order a couple - I'm not much of an electrician, but I suspect they'd be pretty easy to install. Just make sure you turn off the breaker for that zone of your house first! When it is on Amazon, I'll buy it. It will replace the outlet behind my "charging station" that sits on the kitchen counter. The charging station is where the cell phones, iPods, media players and GPS devices reside when not in use. It hides the clutter of the chargers inside but is cramped for space. Many of the devices use USB charging and this will be great for those. Well it surely is not cheap but we need to keep in mind that it is not just a simple plug-in; there must be some kind of transformer in the back. 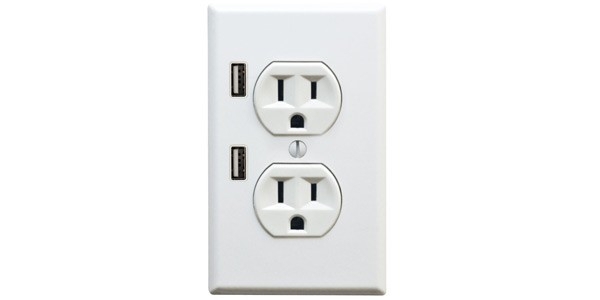 Too bad it's so ugly They could have done a much better job of positioning the USB ports. They have a decora style version (http://store.fastmac.com/product_inf...roducts_id=505). Looks like neither is tamper resistent, however, so they don't meet current electrical code in the US. This is great! It would be better with 2 or 6 more USB ports but I can live with 2 I'd love one of these on my kitchen island! Well, since it kicks out so much power, you could always attach a hub. Hahaha. Could you elaborate on what you mean by tamper resistant?